But doesn’t quite reach the summit. It’s odd watching the city of your youth gradually change and morph, almost imperceptibly, over the years. Commercial Street is a thoroughfare that links Hoxton and Shoreditch in the north with Whitechapel to the south, running right through Spitalfields and parallel to the City as it does so. It was until recently, and still is in a few spots, a rather grimy axis dominated by light industry in the textiles business. But these days it’s better known as the home for a growing selection of superb restaurants including Som Saa and Hot Box. Madame D is the latest in this gradual wave of restaurant-ification, a spin-off from the superlative Indian restaurant Gunpowder which is literally just across the road from Madame D on a side street. 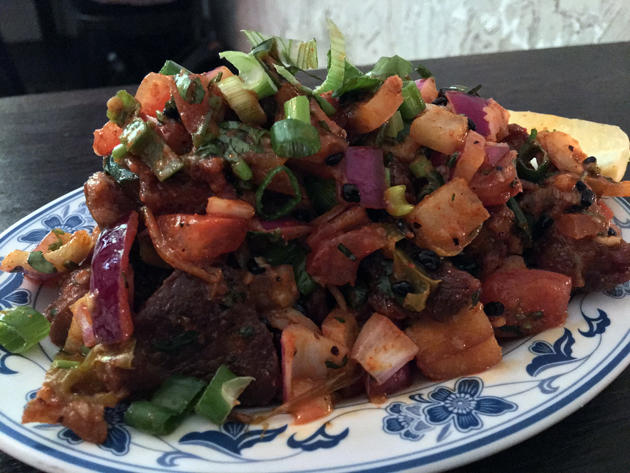 Madame D isn’t an overflow space or a second branch of Gunpowder, but a different beast entirely serving a small ‘Himalayan’ menu – a mix of Nepali, Tibetan and Indo-Chinese dishes. It’s a somewhat odd mix, but hardly unknown in London – the southeast of the city has been home to a large-ish gaggle of Tibetan and Nepali restaurants, such as Woolwich’s Kailash Momo, for years. Those restaurants are cheap-as-chips, almost suicidally so, which makes Madame D’s job all the harder. It didn’t start well. Chilly (sic) paneer, although generously sized, was a stodgy, hard and surprisingly bland mess. 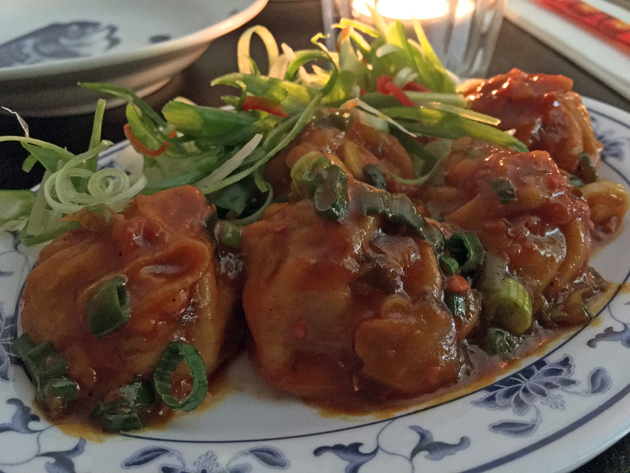 Pork momos were much better, with thick and doughy yet still moderately supple skins. Although filled with a mystery meat and bathed in a sauce with a one-note spiciness, it was still an enjoyable kick in the pants with the small starter-sized portion ensuring it didn’t outstay its welcome. Madame D’s website doesn’t have a menu, but it does have a biography of the entirely fictional ‘Madame D’. She’s like a latter-day Aunt Bessie or Uncle Ben, but with a better marketing ghost writer. Chinatown’s cheap and cheerful crockery is a genuinely decent alternative to the usual Ikea stuff. Largely because it doesn’t involve trudging through a retail warehouse the size of one’s own self-loathing and despair. 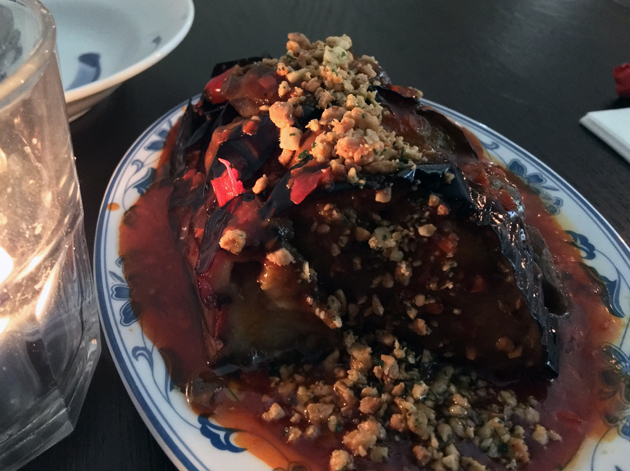 Fleshy slices of aubergine came stuffed with nuts and cabbage. Slathered with the same shurg- yet sweat-inducing sauce as the momos, it proved to be surprisingly hearty. 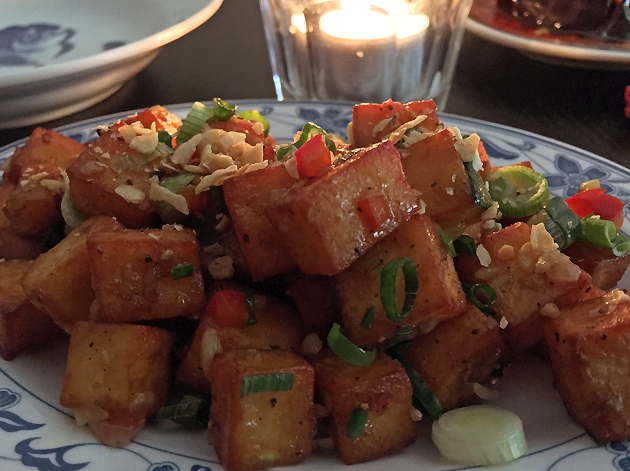 It’s a decent vegetarian dish, both in its own right and as a veggie-friendly alternative to Madame D’s predominately meat-based fare. 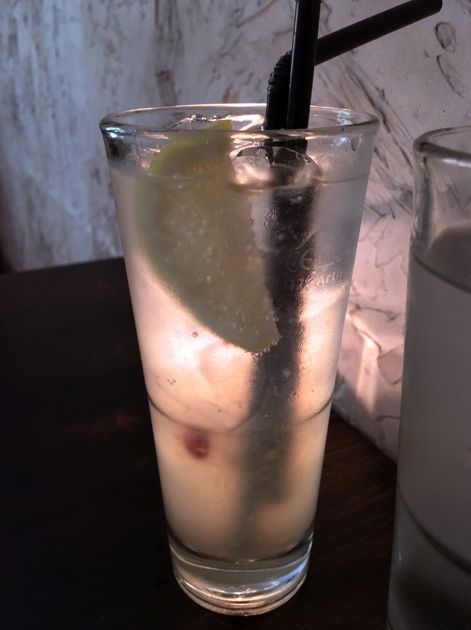 Although Madame D’s selection of non-alcoholic drinks is paltry in size, at least the spicy lemonade was at a winner. Consistently good across all my visits, the gentle fruity heat of the chillies both complimented the citrusy tartness and contrasted with it. It was eminently refreshing, while adding a prickly tingle to my lips. If you blanch at the presence of a small slice or two of chilli in your drink, then we need to have a talk about your infantilised palate. 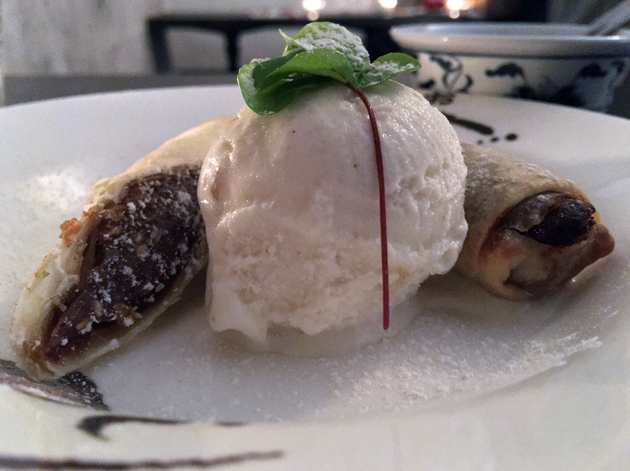 Date ‘pancakes’ with ice cream turned out to be stodgy and crunchy spring roll-style pastry stuffed with pureed dates. It was essentially the deep-fried equivalent of a pair of Fig Newtons. Although the treacly sweetness of the thick date paste was pleasing in an autumnal sort of way, the pastry left much to be desired. It was made much more bearable by the pleasing warmth of ginger flavouring the smooth dollops of refreshing ice cream. Why were there vegetables on my dessert? Coughing up for the beef puff gets you just one of the lonely little things. 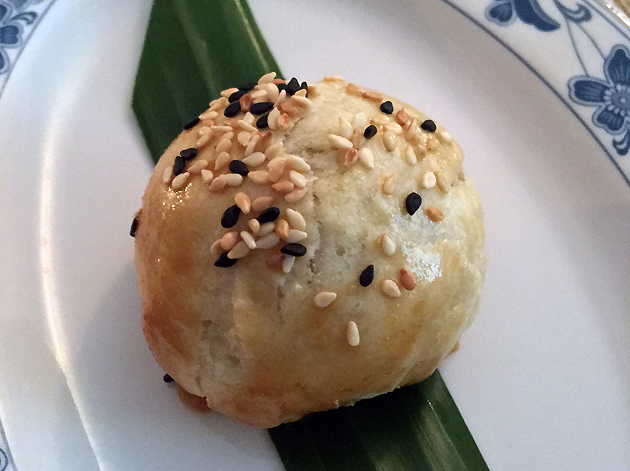 It wasn’t even a terribly good beef puff. Compared to the dim sum standard, the pastry was a bit too soft and doughy while the minced meat inside could’ve been anything. The latter did at least pack a modest spicy tingle. 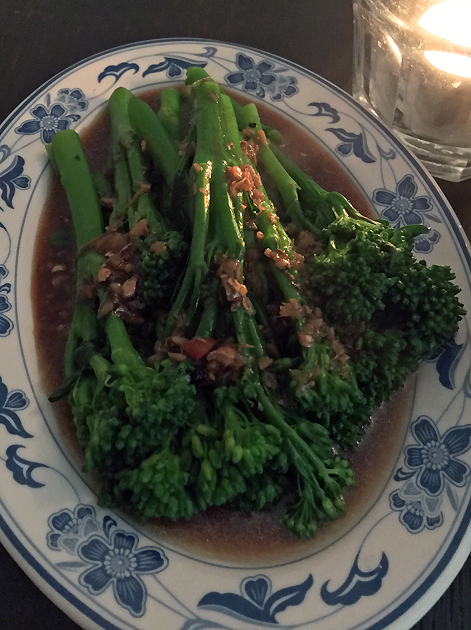 Sprouting/tenderstem broccoli cooked just-so came in an umami, lightly garlicky and occasionally ginger-ish sauce. The sauce had to taken on its own to appreciate those qualities though – the broccoli hardly soaked up the sauce, nor did the sauce cling to the broccoli. The ground floor at Madame D is a bar. But you can also eat there. I was largely unimpressed with the dour noodle dishes at Kailash Momo. Madame D’s egg noodles, while not exemplary, were better – they avoided the trap of being excessively thick, stodgy and greasy like much of the nation’s take-aways. 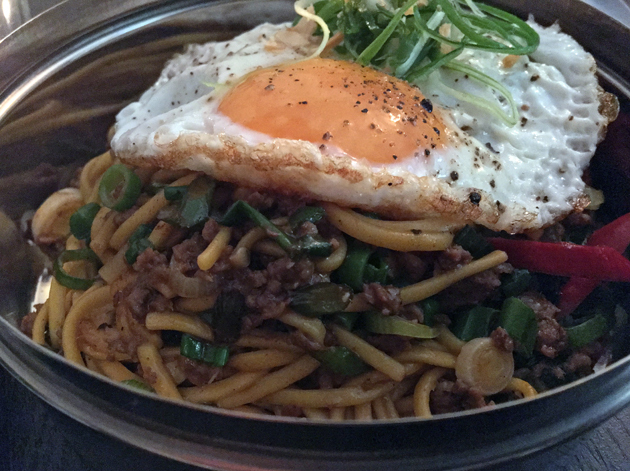 Minced lamb and spring onions, along with another appearance of the one-note spicy sauce, was mixed into the noodles. It was a hearty, lip-tingling dish, but it was the fried egg, of all things, that made it. The rich runniness of the yolk provided some much needed variation, but its small size meant its presence was quickly missed. It could’ve been almost any meat, really. The date pancakes were just as two-sided as before. 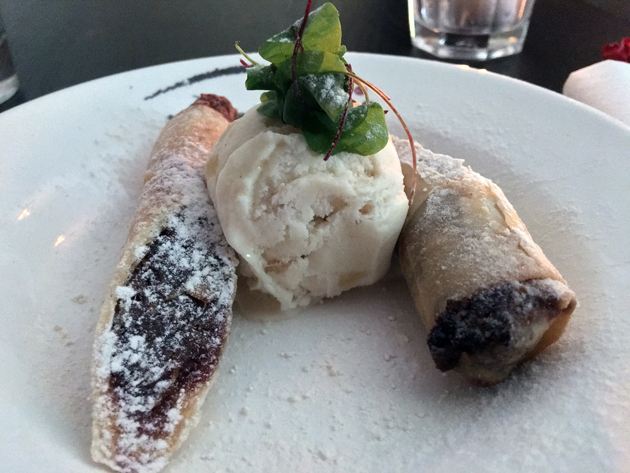 It doesn’t come as any surprise to learn that this dessert has already been retired from the menu, with the ginger ice cream accompaniment taking its place entirely. A wise choice. If I were a cynic, I’d describe the Pork Nepali as a thinly-veiled version of sweet and sour pork. Given the short menu, it seems like an odd waste of an opportunity to devote a slot to a version of this overly familiar dish. Having said that, at least this big heap of meat pleasured my mouth. The chunks of pork were crisp and dense on the outside, almost like jerky, yet ethereally airy and almost wispy on the inside. Sharp and crisp red onions accentuated the lip-pursing tang of the sweet and sour sauce, which turned to to be far more layered and nuanced than your average day-glo take-away sauce. Far better than I thought it would be. 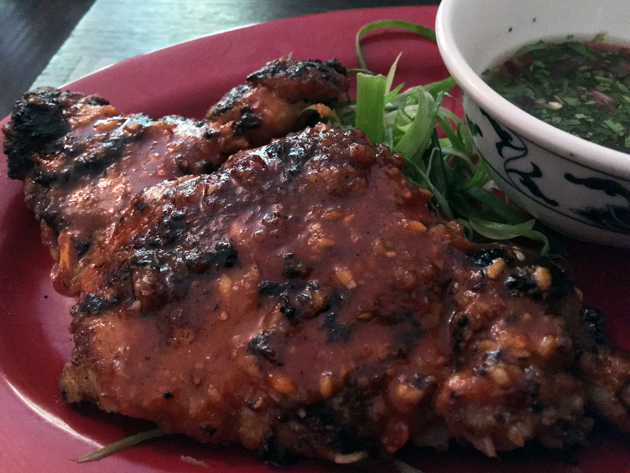 The porcine qualities of the pork chop were largely absent, leaving it to the sauce to pick up the slack. This wasn’t the one-note affair from previous visits though – peppery hot with a hint of underlying fruitiness, it was a burst of unexpected fun. Oddly, a small bowl of lightly sour and umami dipping sauce, almost certainly based on fish sauce, came on the side but it proved to be entirely unnecessary. For some reason, I keep mistyping ‘Madame D’ as ‘Madame D’s’. Madame D’s fried chicken was somewhat similar to a Japanese-style chicken karaage, with moist and meaty fillets battered in a supple, occasionally ginger-ish coating. 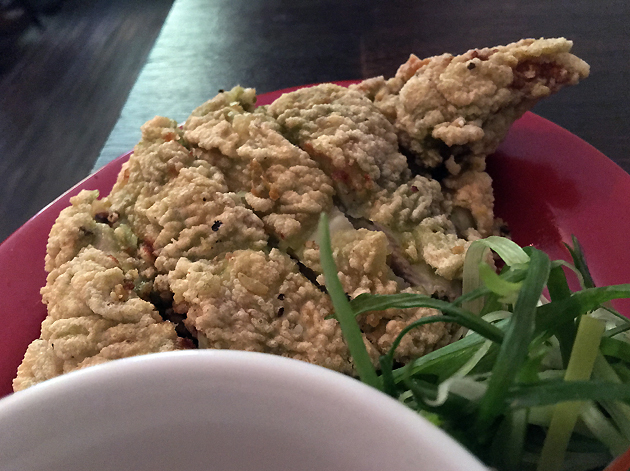 The battered exterior was supple, rather than crispy, and dotted with little air bubbles. It was all enjoyable enough, especially when taken with the fish sauce-based dipping condiment, but it was ultimately unmemorable. Keeping a-breast of all the latest restaurants can be meaty work. 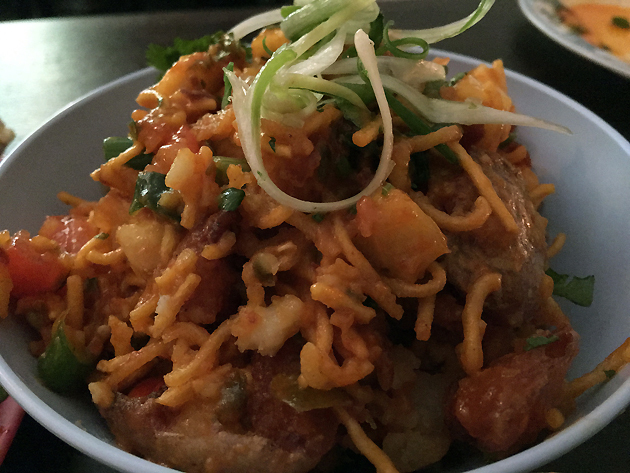 Although not crispy in the slightest, the ‘crispy’ potato and noodle bhel was certainly filling. A mountainous helping of hearty potato and chopped noodle bits came doused in a fruity sweet sauce that had regular intermissions of tart sourness. As a lover of all things tangy and lip-pursing, I’d quite happily inhale a ton of this stuff while watching Netflix. 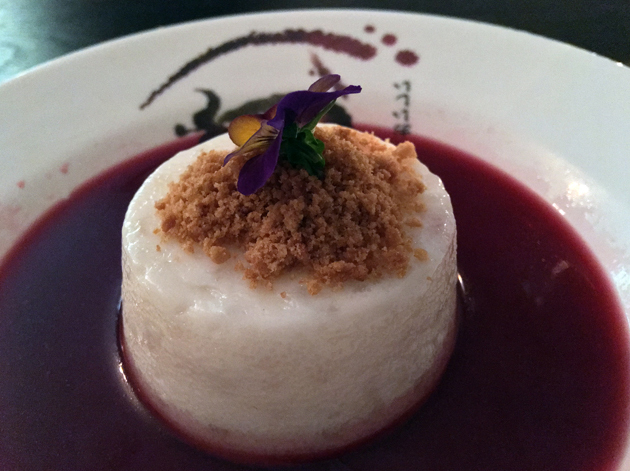 A rather unimaginative vanilla ice cream has been replaced on the menu by a sago pudding. But rather than the soup-like concoction that I’m familiar with, it arrived in a solid jelly-esque or creme caramel-like form. Gummy in texture with a distinctly but not overpoweringly sweet and starchy taste, it sat in a large puddle of distinctly sharp and herby hibiscus sauce. Putting aside the dusting of crunchy ginger, which was too small and tame to leave much of an impression, this was an unusual but ultimately rather pleasing dessert. If you’ve gotten to the stage where you no longer expect your desserts to be cloyingly sweet, then you’ll get along with this oddity just fine. Madame D deserves credit for doing something different, but that credit only goes oh so far. Although there were some outright duds, there were also some winners with tingly hot, sour and tart flavours. However, I’m sceptical that there’s any further potential to Madame D beyond that. 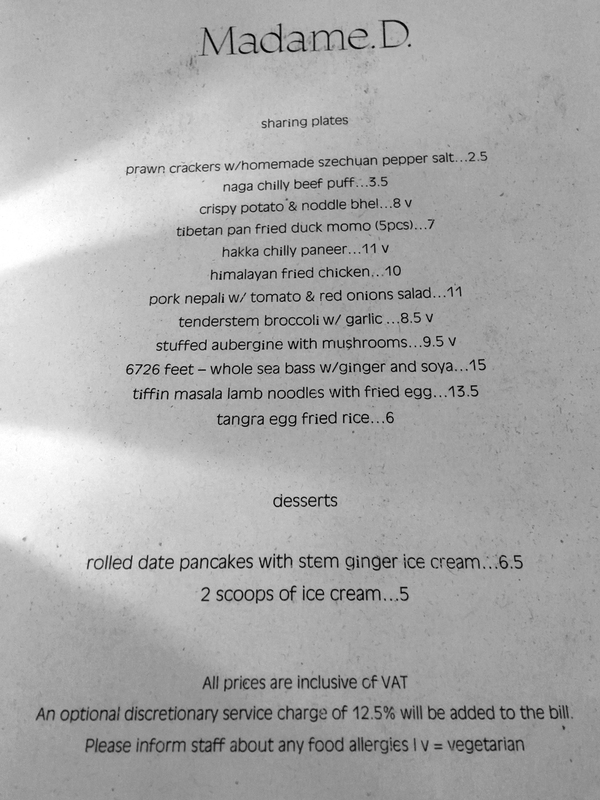 And, at the risk of falling into the crass ‘ethnic food must be cheap’ trap, if you live near or are willing to travel to the wilds of south east London, then a world of cheaper Nepalese and Tibetan restaurants are open to you. Madame D is Gunpowder’s troubled second album – different, interesting but ultimately not quite good enough for regular and repeat enjoyment. Opening Hours: Tuesday-Saturday 18.00 – late. Closed Sunday and Monday. Average cost for one, including soft drinks: £35-45 approx. Tags: aubergine, broccoli, dumplings, fried chicken, gunpowder, ice cream, lamb, lemonade, london, madame d, noodles, paneer, pork, pudding, restaurant, review, sago, spitalfields, sweet and sour, whitechapel. Bookmark the permalink.